April | 2015 | Dude, Where's My Shelfwork? While mindlessly scrolling down my Facebook feed today, I came across this post on Edutopia about having a teaching motto. 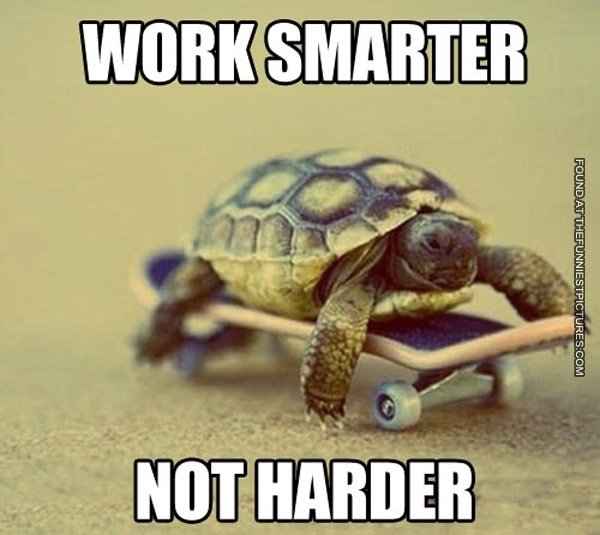 I guess that my personal motto also is very much a part of my teaching methods, and I hear my students repeat it to each other from time to time, “Smarter, not harder”. My desktop publishing teacher, Nan Kolbinger, used this as a mantra in our graphics class where we learned to make the computer and software do the magic of designing for the school’s production shop, and it perfectly summed up the lessons my grandfather taught while we were doing ANY project. He was all about optimizing your efforts to get the best product whether it was what HE called a “5-minute” job *cough-3 hour job-cough* or a larger woodworking project. He had spent a lifetime figuring out the BEST way to use a hammer, the best angle to use the least force for splitting wood, you get my drift here. These two are some of the most influential people in my life, and the idea of doing things well, and efficiently, so that you don’t have to waste time or energy has become my personal philosophy. I use it with work, with my own learning, and even with baking/crafting in my free time (what’s that? lol). I have arranged my classroom so that the students have all of the materials that they need in designated spaces. All of the shelfwork for the week, and any recording sheets and controls, is on the front bookcase under the classroom TV. Once we have moved on, it gets relocated to the drawer files on the counter and they will all be there for the remainder of the grading term. All handouts are kept in the Sorry We Missed You bin and are labeled with the name of the activity and the week of the cycle. You can see a picture of this bin at the top of the page. Table jobs have been such a time saver for me! Now the students are more involved, and I have less to get done on my own. This also took care of my problem with a handful of students always asking for the same job. Now, everyone gets a chance at it and I don’t have to remember which student I said could do it next. Shelfwork and worksheets are mainly done on students’ iPads now. I have 2 apps that I like for these activities that kill a large chunk of forest. I will either make a worksheet/answer sheet and use a great app called Handouts to take a picture and distribute to my students, or students will use the app Skitch to take a picture of their shelfwork and email it to me. I am saving trees and the amount of paperwork I have to lug home on the weekends! Both of these are free apps, and although Handouts claims there is a 3 month free trial, I have never been asked to pay and I have been using it for 6 months. Incidentally, Skitch is part of the Evernote suite, which I need to spend more time exploring since it seems to be a great way to work even smarter! Planning and collaboration is done in my department through Google Drive. All of our documents are saved where we can ALL access them. We can all type on the same document or work on the same presentation (like we just did for the History of Writing Great Lesson), and we can make copies of it and tweak it to fit our specific classes. Our school uses Google Forms to keep track of our Home Communication Log, and my PLC group uses Sheets to monitor which students can participate in enrichment activities. Through the use of Doctopus, a Google Extension, my students are able to revise and edit with the help of their peers (as limited or unrestricted as I choose), and with Goobric, another extension, I can put the rubric right on the assignment and it records the scores on a spreadsheet. Amazing, RIGHT?! Parent communication is something I am still working on optimizing. I am using traditional means such as phone calls and emails, but I am also maintaining a classroom website and blog with explanations and links to pretty much EVERYTHING we do in class. I’m trying to make it so there are no excuses for not having what you need to succeed in my class. What is YOUR motto, and how does it influence your teaching…life? *Check out the blog that I found this picture on! I found the Safety Hacks post to be great information about doing some things better for my own blog, AND I wasn’t even looking for that! Categories: Uncategorized | Tags: montessori, teachingmotto | Permalink.